Everything you need to know about this important document in the media production industry. Ensure musicians are fairly compensated for their work, and learn the difference between sync rights and public performance rights. Gain extensive knowledge with our Ultimate Guide to Cue Sheets. How Do Composers Get Compensated For Licensed Works? If you have licensed music for a media production, it’s imperative that you have a solid understanding of what cue sheets are. A cue sheet is a written summary of the music used in a media production. The cue sheets are used by broadcasters and distributors to inform artist’s performance rights organizations (PROs) how often people are hearing a particular piece of music. These documents provide the most accurate method of ensuring that everyone involved with a production’s music is fairly compensated. It does not matter where the music license came from. Both restricted rights-managed and royalty free sync licenses (like from stockmusic.net) only give you the rights to synch the music to your media. These licenses do not cover the Public Performance of that media. Remember: synch applies to the rights to use the music in your media. Public performance applies to the presentation of that media. Learn more about the details of licensing music here. Who Do Media Producers Submit To? Performing Rights Organizations (PROs) represent composers of the music. The PROs are in charge of collecting royalties generated by media (such as when the media is broadcasted on networks). These organizations then distribute a percentage of these royalties out to all the responsible parties for the compositions. A PRO is a middleman between the music copyright holder and the parties who use the music in a commercial setting. Their primary job is to collect royalties and distribute them to the correct copyright holders. The most popular PROs in the US are ASCAP, BMI and SESAC. in Canada there is another PRO called SOCAN. For PROs throughout the world, there is a long list of societies that collect royalties for the usage of copyrighted works. Wikipedia has a good comprehensive list here. PROs are important to musicians because without them it would be impossible to keep track of who uses their compositions. Networks do not pay out royalties directly to musicians. Instead, it is standard protocol to let a trusted entity like ASCAP take care of all the technical details of licensing so that broadcasters can focus on pleasing their audiences, and musicians can focus on their job as composers. The submission of cue sheets begins with the composer ensuring their information is accurate in the music library. Next, the media producer or a music supervisor will compile all the places music is used or “cued” in the media. The cue sheet is then passed to all vested parties. 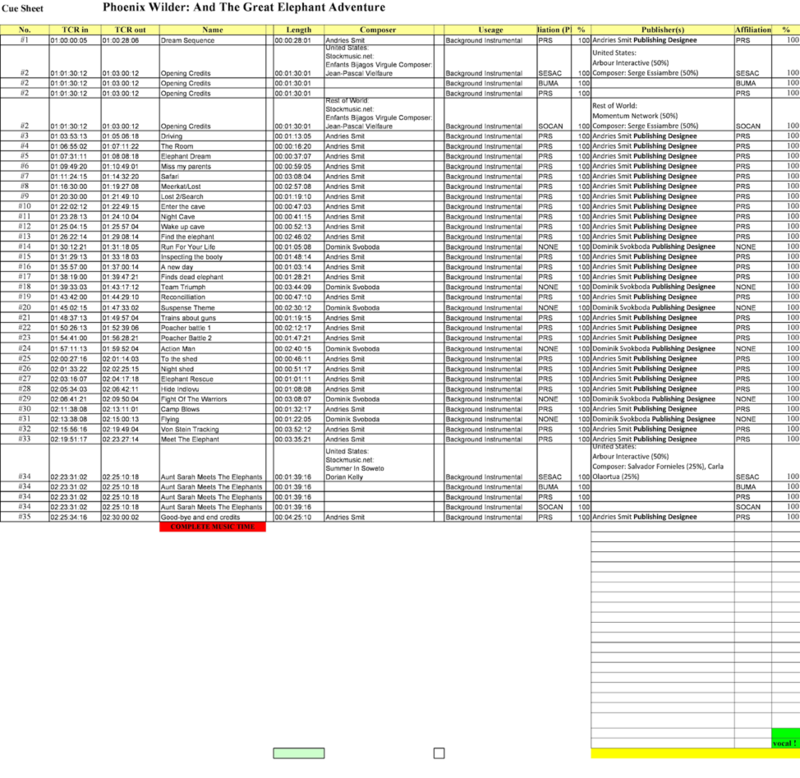 The production company is responsible for distributing the finished cue sheet to media publishers and broadcasters. Sometimes they also forward them to composers, attorneys, music publishers and libraries. Typically, it is the media publishers and broadcasters who submit the final cue sheet to the PROs. Often this is done via email, an example which is ASCAP’s email address: cuesheet@ascap.com, but some PROs have their own submission portal. Check directly with the PRO to find out how they like to receive cue sheets. ASCAP also has a program called EZQ to help you submit multiple sheets easily (https://www.rapidcue.com/). There is no specific “industry standard” format for a cue sheet. However, there is a certain list of required information that needs to be present for a cue sheet to be acceptable. As long as the song title, writer and publisher information, song duration, and usage category are present there shouldn’t be any problems. However, there are nine categories a musical work can fall under, with each generating a different amount of royalties. The cue sheet data may also include details about how long the music is played, how often and if it’s background or foreground, opening credits, if there is voice over etc. It also must include accurate copyright holder information for each music track. Very quickly, a typical cue sheet turns into a large spreadsheet. Which One: Synch or Public Performance? Almost every piece of visual media has some sort of music playing in the background. Think of all the internet tutorials, commercials, or presentations out there. Without audio, the video content would be stale and uninspiring. A sync (short for synchronization) license gives the media producer the rights to synchronize the music to the media production. “Media Production” is often defined as “a visual production”, but it can also be used for podcasts, radio production, radio advertising, etc. We like to describe it as anything that is a “non-music-only production”. Whenever you walk into a business you’ll often hear background music playing on the speakers. While this music may go unnoticed most of the time, that doesn’t make it free. The business is using audio in a commercial setting, requiring the purchase of a Public Performance license to present their audio selections. The same requirements apply to music you hear on TV and the radio. Background music in commercials, movies, and shows also require a Public Performance License. The good news for media producers is, the public performance license rarely applies to the producers of the media. Almost all the time (in USA, Canada, Europe, and probably most everywhere else), this is a contract between broadcasters and the Performance Rights Organizations. This makes sense because the broadcasters control when and how often a piece of media is published. For example: a music track played during a Superbowl commercial is entitled to more royalties than one played during reruns of The Brady Bunch at 1 AM. This basic truth puts the responsibility on the media outlets to inform the Performance Right Organizations what is played, when and how often. This is what cue sheets are for. ASCAP also created an application for managing cue sheet data called RapidCue, which has become a standard format that we highly recommend. This format is widely trusted and used almost exclusively by CBS, NBC, Disney, Fox, Sony, Paramount and many other world class production companies. A link to more information about RapidCue can be found here. The first seven categories are considered a featured performance. They generate much higher performance royalties than background performances. Generally, the more prominent the performance is in a scene, the more performance royalties it will generate. In case you were wondering what a cue sheet looks like, we’ve included one above taken from Richard Boddington’s work on a film to be released by Lionsgate later in 2018 called “Phoenix Wilder And The Great Elephant Adventure”. A number of these tracks have ties to our website, and it’s been a pleasure seeing the work of our composers come to life in a film setting. Check out the trailer for the film here. So What Is Royalty-Free Music? At stockmusic.net “royalty free music” means a licensor can pay a one time fee and synch the music however they want, as long as they want. They will never be required to renew the synch fee even if they use the music in a new production. It doesn’t matter if it’s for commercial or private use. They can fade in, voice over, add production sound effects all they want (as long as they don’t alter the underlying musical work). However, this doesn’t mean the composer is not entitled to royalties from public performance. The difference between a royalty-free license and the alternative “rights managed” license is rights-managed music implies strict usage rights, typically for a limited time span. A Rights Managed license, often called “Needle Drop”, requires the purchaser to pay a fee every time the track is synched. Typically needle drop licenses have a limited time frame when the music can be used. There are often renewal fees built into the contract as well. To contrast, a royalty-free license gives the media producer a lifetime of synching. To learn more, checkout the stockmusic.net Media Producers License. People whose work involves licensing music for a media production will often find themselves using cue sheets. Use this guide as a reference for the many details concerning cue sheets. As long as you have a basic understanding you will be prepared to tackle any challenge presented by music licensing. Cue sheets are essential documents that keep track of all music used in a media production in a log-style format. In order to understand cue sheets, you must first learn to distinguish the two types of licenses: synch and public performance. Also important is a thorough understanding of the purpose of PROs and where they stand in the media production supply chain. Finally, keeping in mind the bigger picture you’ll start to develop an even broader understanding. The process starts with the composers, then the product created will go to a library from which media producers can purchase music from. Media producers submit cue sheets to all involved parties such as PROs and broadcasting networks. Money is generated in fees paid by the broadcasters, which are then given to the PROs who distribute the royalties out to all copyright holders. Tony Lefaive is a music curator at stockmusic.net who spends most of his time working towards his Bachelors of Music at the University of Washington and developing his craft as a musician. He plays both electric and upright bass in a vast number of groups spanning many genres. You can regularly find him playing gigs around the greater Seattle area for both public and private events. When he’s not practicing bass, he likes to go on spontaneous road trips to discover adventures beyond the standard routine.